Looking for something to do with the kids to celebrate the New Year? 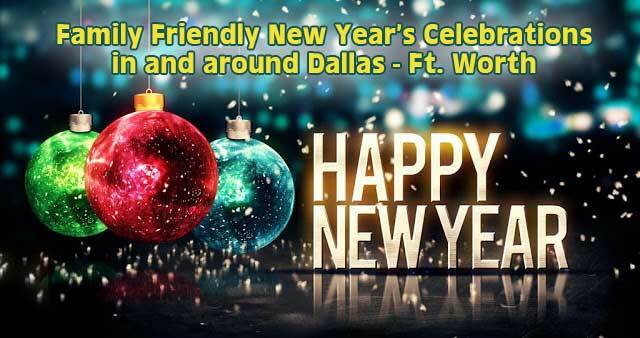 Check out some of the family friendly New Year’s Eve happenings around town. Please check the website and/or call ahead as event times may be subject to change. A FREE event on New Year’s Day at Fair Park featuring a variety of children’s activities, live music, magical performances, karaoke, bounce houses and amusement rides, culminating in a spectacular firework show set to the soundtrack of The Avengers. Doors open at 3pm, Fireworks launch at 7pm. Celebrate a safe, fun, and family-friendly New Year’s Eve while enjoying 2 million dazzling lights in the world’s largest light maze. Join us for an EPIC New Years celebration. There will be a DJ, multiple ball drops, raffles, duck races, and other activities all day. Two pricing options available. Dave & Busters is offering a fun way for you & your family to ring in the New Year with their New Year’s Eve package. Various locations. Join other enthusiasts for a 1.5-mile guided hike along Spring Point Trail at Lake Tawakoni State Park from 9am – 10am. Bring water and your camera. In a fun and daring tribute to the birth of the modern circus, Dallas’ own Lone Star Circus brings its unique brand of spectacle back for the holidays in this all-new show! Jugglers, acrobats, clowns, and four-legged performers from around the world come together to create a parade of not-to-be-forgotten moments for the entire family. Join other enthusiasts on Monday, December 31 from 11:30pm for a 1.5-mile guided hike along Lake Mineral Wells State Trailway explore the creature sounds of the night and the Texas winter night sky. Bring a flashlight, bundle up for the weather, wear sturdy shoes and bring water for the hike. Hikes are free with paid park entrance fee or a State Park Pass. Let your kids express their creativity while you enjoy some time to yourself. Ages 3-9; 9am – 12Noon. Join Miss Samantha on Friday, December 28 from 10am – 12Noon for a morning of crafts, snacks, dancing and celebrating as we ring in the New Year at noon! Please note: party snacks and juice will be provided, water bottles are encouraged. Ages 5 – 12 (4 year olds are permitted to attend with an older sibling). $15 per child, space is limited and pre-registration required. Drop the kids for an epic evening of New Years fun at Challenge Island. In addition to STEAM activities, there will be a balloon drop, sparking cider toast, glow products and surprises through the evening. Cost is $50/child (sibling discount available); appropriate for kids 5 years and older. Celebrate the New Year early with crafts, activities and a countdown to 12:00 NOON! Harrington Library from 11am – 12Noon. All ages. Free event. Join us for a family friendly flower ball drop! Celebrate New Year’s with us at the Rory Meyers Children’s Adventure Garden! Celebrate the new year with young children at Smith Public Library from 11:15am – 12Noon on Monday, December 31. Festivities geared towards kids ages 0-5, but all family members are welcome. Children ages nine (9) and younger must be accompanied by an adult. Wristbands are required to attend. They are free and will be available in the lobby at 10:00am on the day of the program. Locations around the city will host watch parties for revelers ringing in the New Year with the perfect view of Reunion Tower. Scout out the best vantage points on the west side of the Trinity River, along the levees and Trinity Overlook Park, then watch and listen to the radio simulcast on ALT 103.7 FM. Know of an event to add to this list? Let us know! Want to share these events on your website? Share a few then link back to this article at NorthTexasKids.com.